We have found that gardeners and landscapers are tending to shy away from re-planting larger trees and are preferring shrubs and smaller plants as an alternative. Although shrubs can be a good compromise to smaller gardens, there are still suitable small trees that are all too often overlooked. Adding a Tree to your garden is a long time investment that will provide reward to you and future generations. Do consider this that Trees play a large role in creating an aesthetically pleasing place to live, relax and enjoy. Trees will provide shade, soak up noise and pollution, provide a wide range of wildlife habitat, a useful screen and enhance the character and value of your home. Other important benefits that you can’t see or feel and often forgotten is oxygen production and has been scientifically proven to enhance healthy living. Allow us to help you choose the right tree for your garden, whether it is a large estate or small courtyard. Our maintenance services help people manage their trees safely and sustainably. 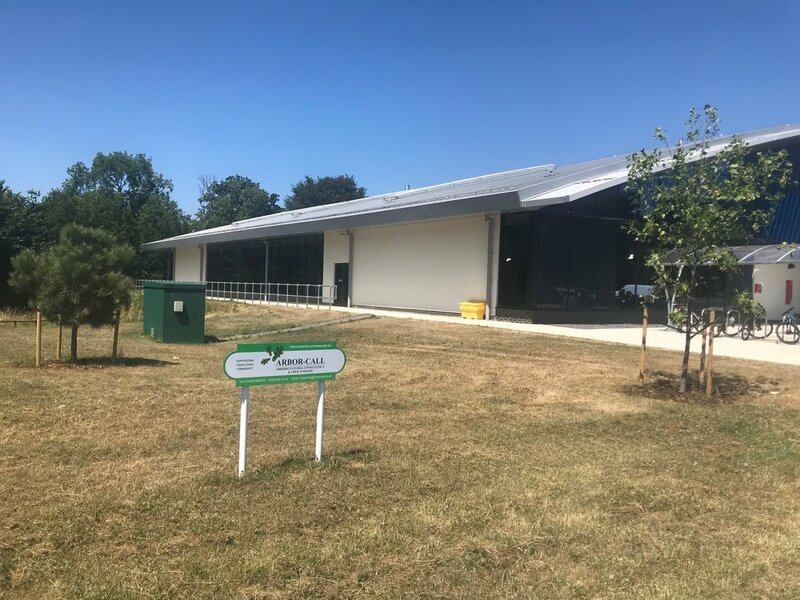 At Arbor Call we have recently sponsored a portion of the site at the new Leisure Centre in Sarisbury Green by donating three trees & lifetime care of these trees to the new Holly Hill Leisure Centre. The old Coldeast Hospital is the site for a new state of the art multi-million pound leisure centre. The centre boasts two new Swimming Pools, full size gym & group exercise studio. We have donated a Scots Pine, Tulip tree & a London Plain, located on the once barren ground, to the left hand side of the building. Birds of prey will be attracted to the optimum nesting branches of the Scots Pine; the Tulip tree will provide colour during warm & cold weather, turning vibrant yellows & red in the Autumn; the London Plane, so called, as it is the most commonly planted tree in London. The three trees will be pruned & watered regularly & when grown, will provide much needed shade to this area of the site.